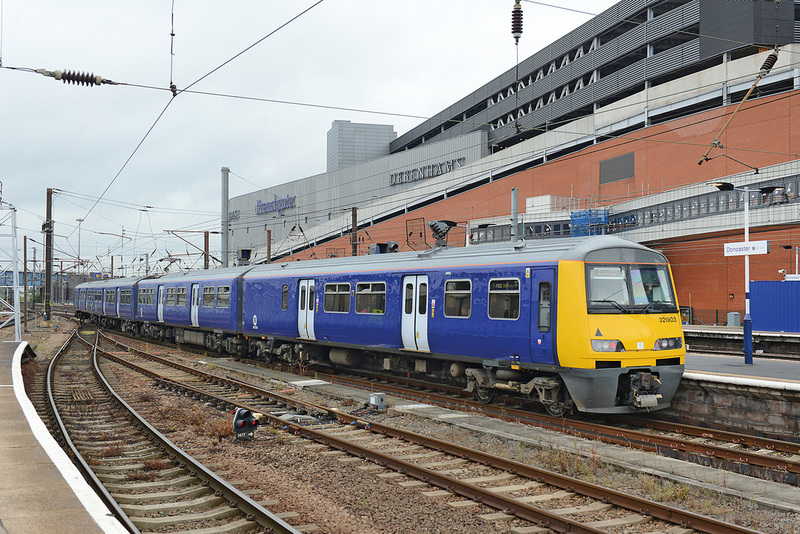 Desiro City, Class 700 No. 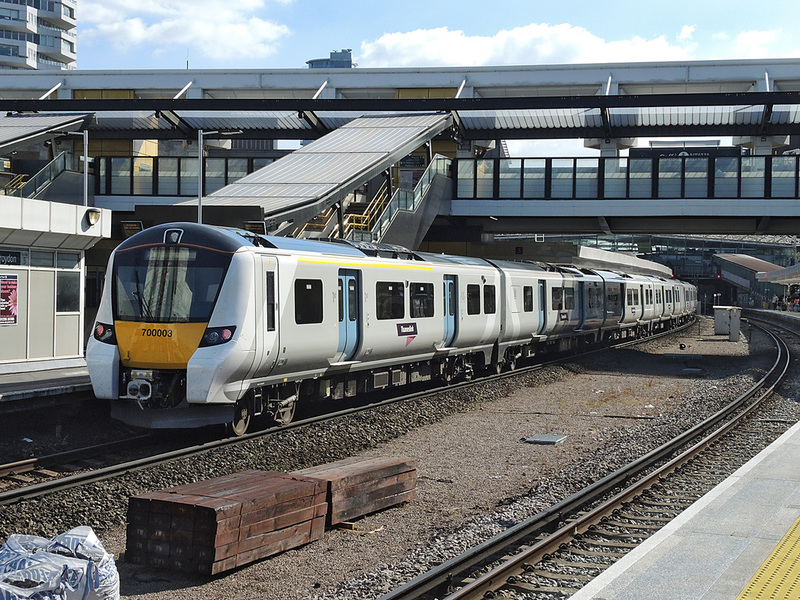 700003 stops at East Croydon on 30 August 2016 forming train 3T23, the 14.26 London Blackfriars to Three Bridges via Preston Park. 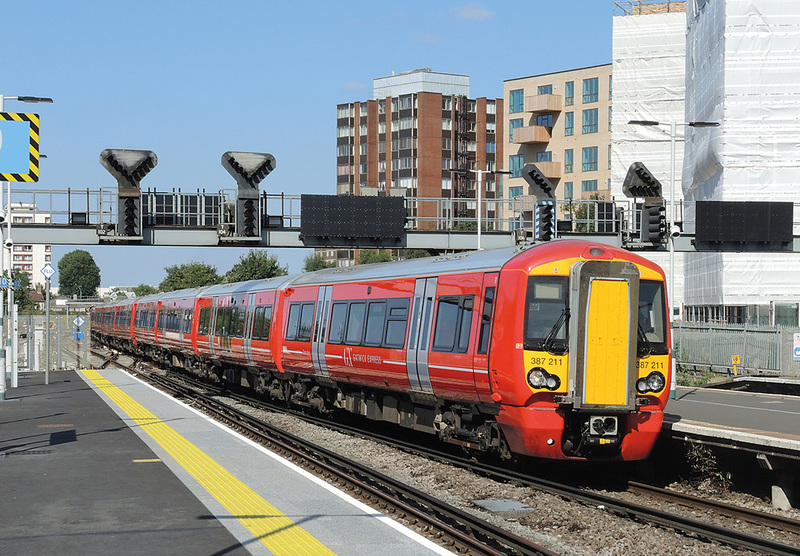 Gatwick Express 'Electrostar' Class 387/2 No. 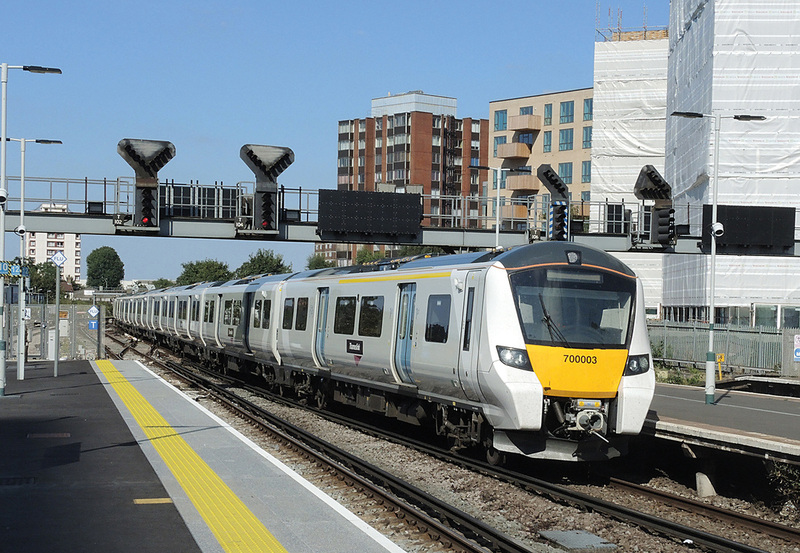 387211 leads a 12 car formation through East Croydon on 30 August 2016 forming train 1D88, the 14.45 London Victoria to Gatwick Airport. 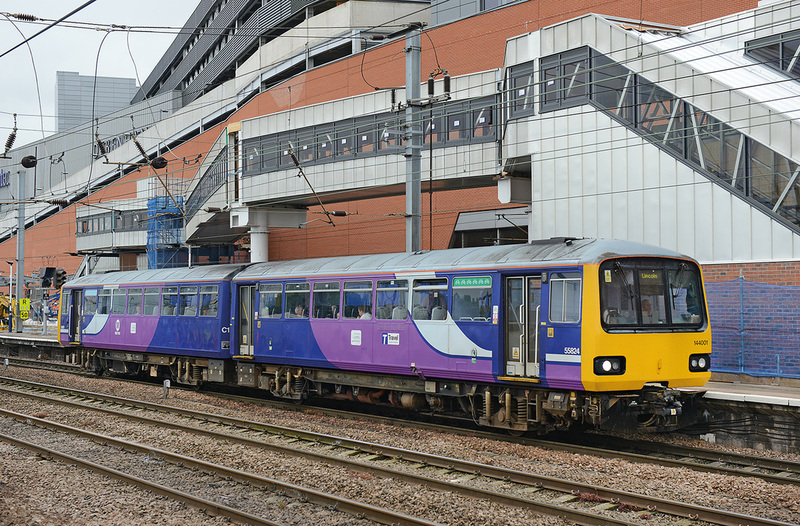 Class 442 No. 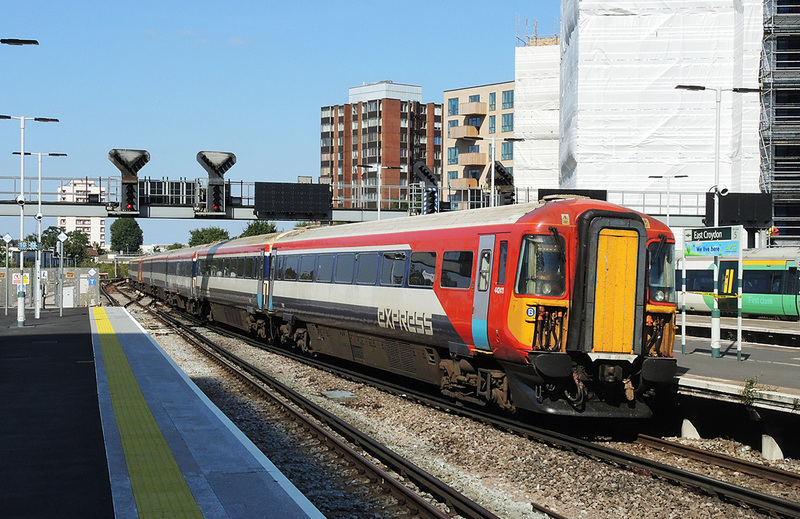 442411 passes East Croydon on 30 August 2016 forming train 1A68, the 15.00 London Victoria to Brighton (Gatwick Express) service. 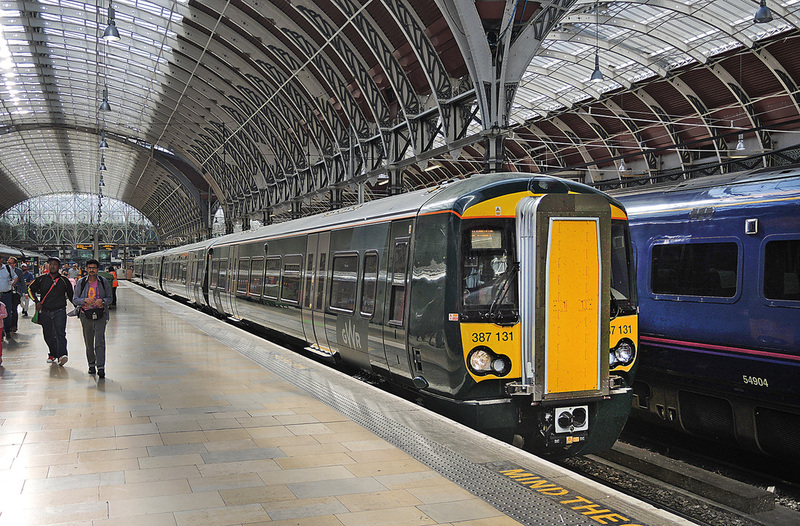 The latest of the Bombardier 'Electrostar' product platform, the Class 387/1s for Great Western are about to enter passenger service between London Paddington and Hayes, and for the last couple of weeks a handful of sets, outbased at North Pole depot, have been used on driver and staff training trips over the route. 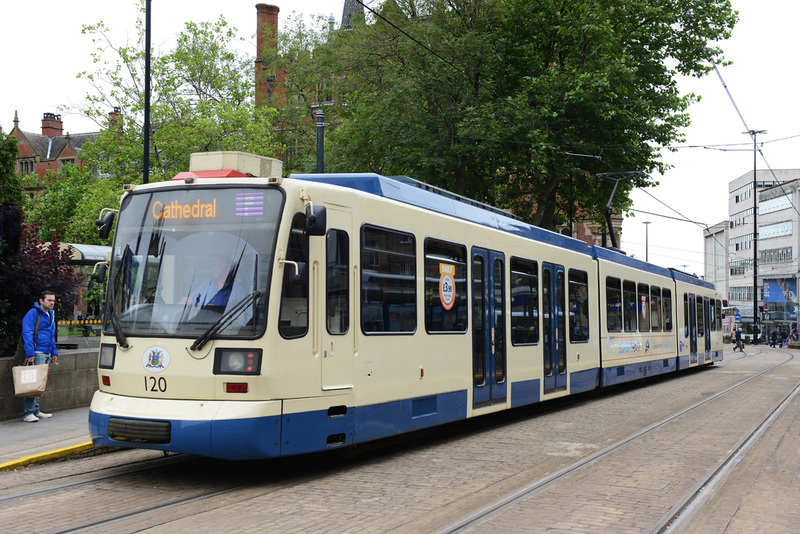 Now in full livery, set No. 378131 is seen in platform 4 at London Paddington on 30 August 2016 forming train 5Z52, the 10.20 training special to Airport Junction. 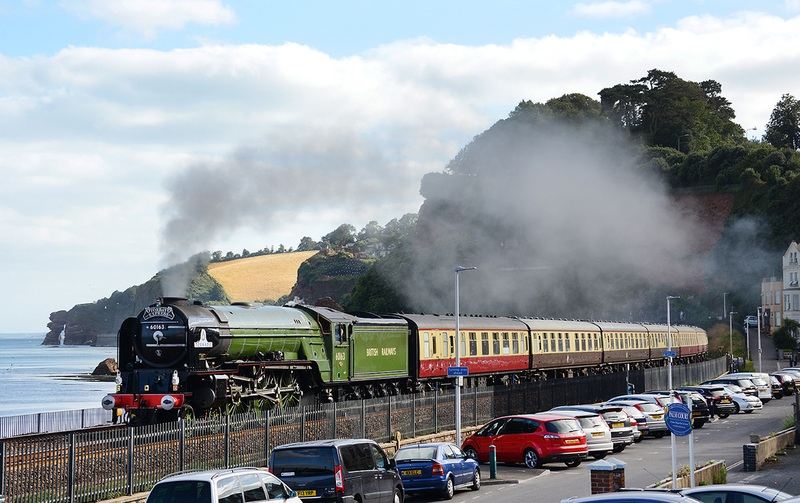 A1 60163 Tornado heads out of Kennaway Tunnel and adjacent to Marine Parade, Dawlish on 7 August 2016 powering the return 'Torbay Express' from Kingswear to Bristol Temple Meads. Looked and sounded nice. LMS 'Duchess' No. 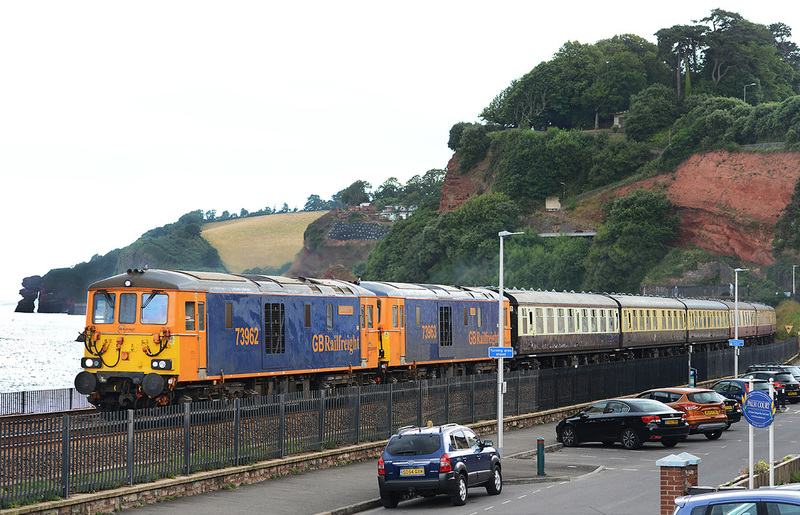 46233 Duchess of Sutherland storms west through Dawlish on 7 August 2016 powering 1Z37, the 08.48 Bristol Temple Meads to Par. And the sun came out……. 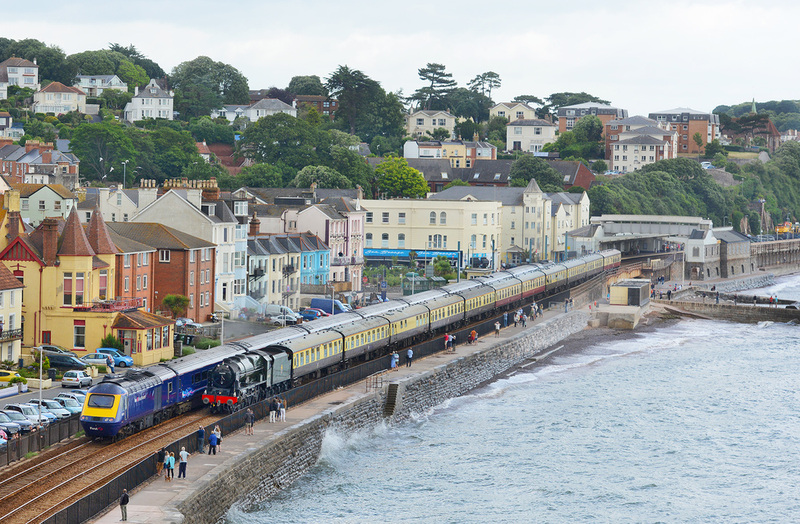 A1 60163 Tornado heads along the sea wall at Dawlish on 7 August 2016 powering the 'Torbay Express' from Bristol Temple Meads to Kingswear. 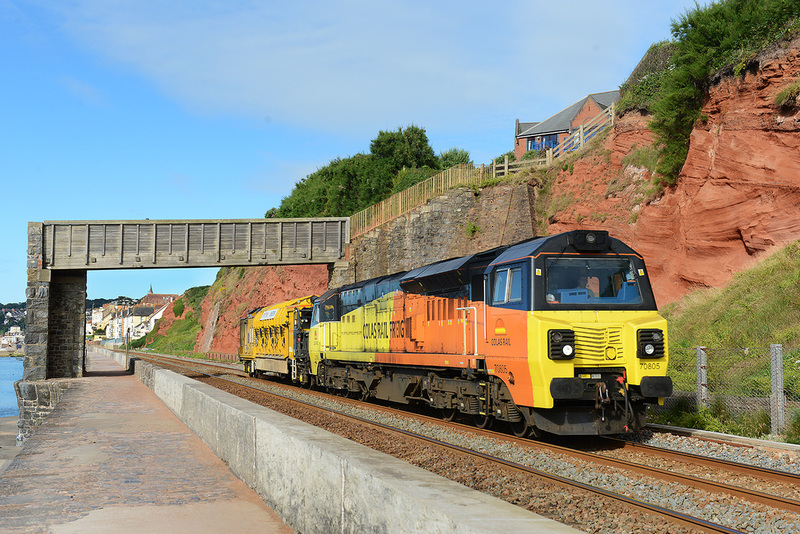 Weather not too bright here this morning 7 August 2016, so the Colas Rail Freight Sunday Yellow Bash is a bit different this week, a direct broadside using a 17mm lens showing 70810 and RailVac4 passing Dawlish on the 08.35 Dainton to Exeter Riverside. 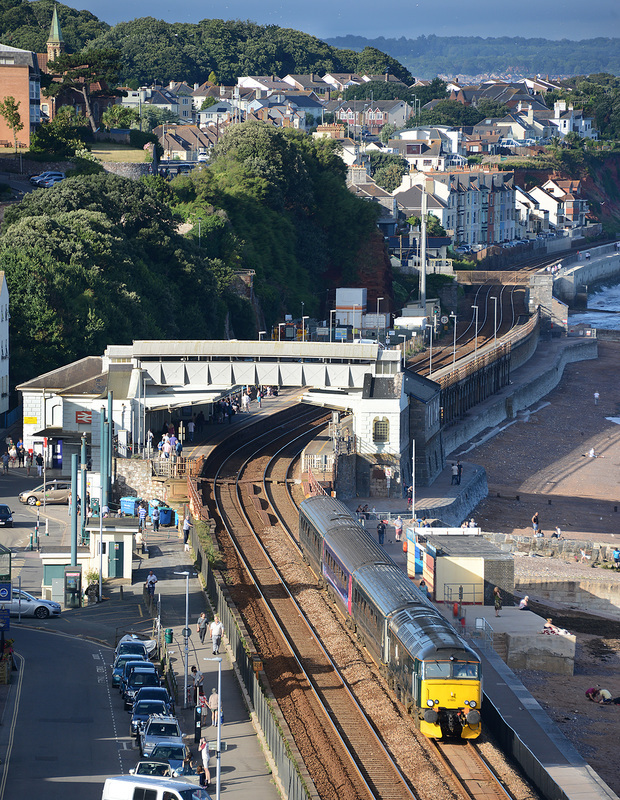 Well, at least the sun stayed out for the return of the GW loco hauled train today (6 August 2016) to allow one of the best views of Dawlish and Lyme Bay that is possible from the top of Lea Mount Gardens. Powered by Class 57/6 No. 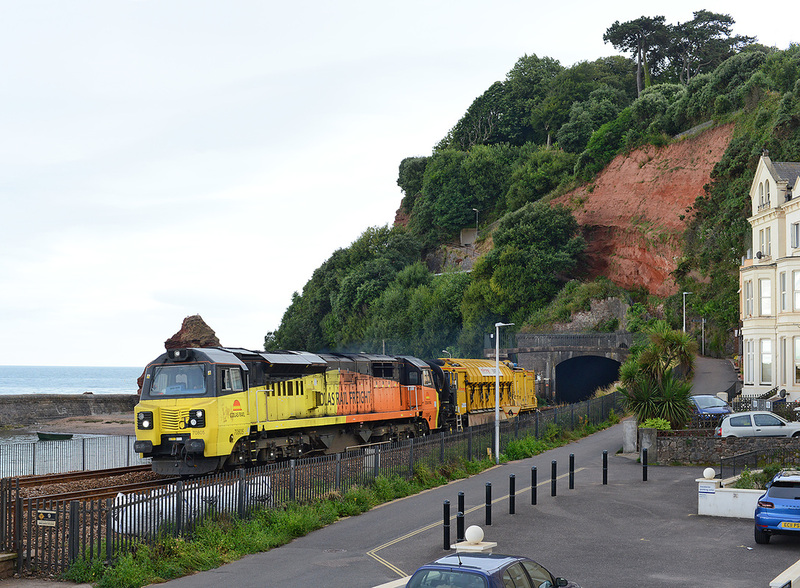 57603, the 17.50 Exeter St Davids to Penzance pulls away from its Dawlish Call and heads towards Kennaway Tunnel. Not much else to phot today (6/8/16) apart from the GW Class 57 No. 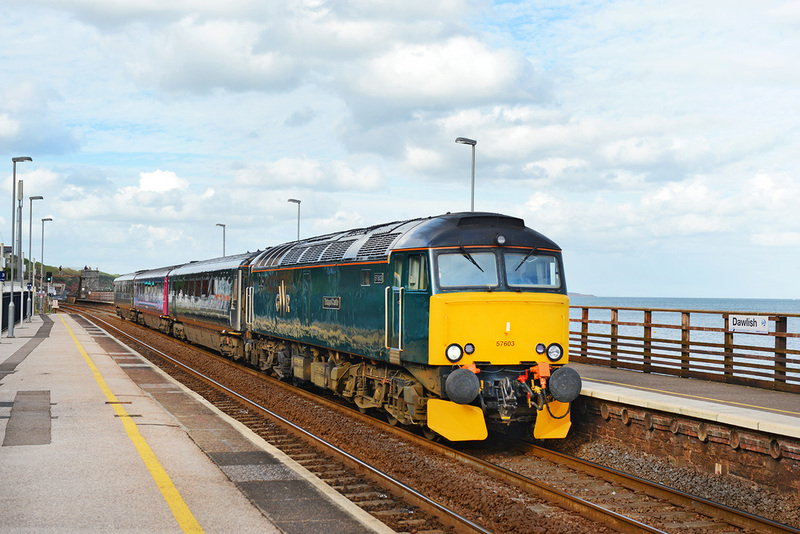 57603 on 2E75, the 13.35 Plymouth to Exeter St Davids, seen passing below the Coast Guards Footbridge, Dawlish. Sun at this time of day is quite difficult. 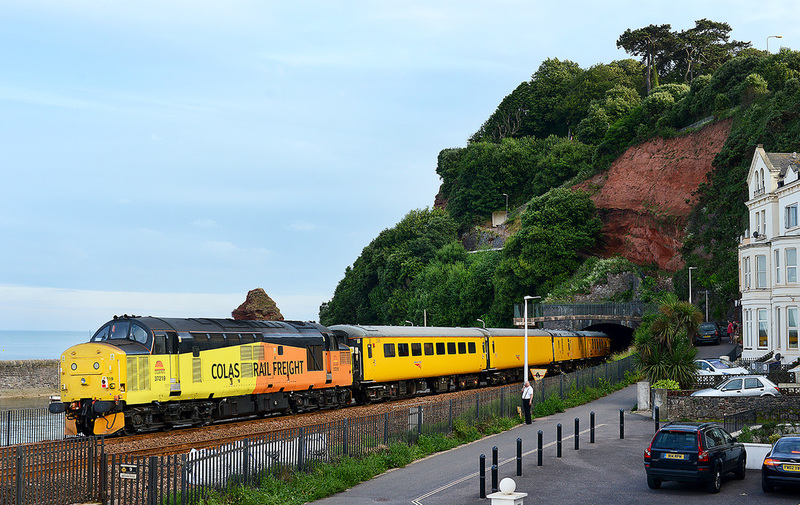 The Dawlish Sunday Yellow Gala continues today 31 July 2016 when Colas Rail Freight Class 70 No. 70802 powered RailVac 4 as train 6X54, the 08.35 Dainton Tunnel to Exeter Riverside. 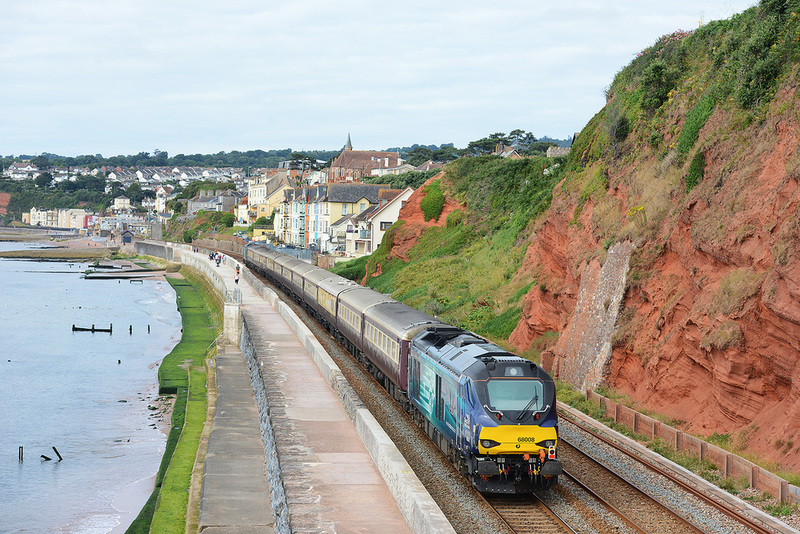 Today, seen approaching Rockstone (Black) Bridge mid-way along the Dawlish Sea Wall. Nice light, but how long will it last! 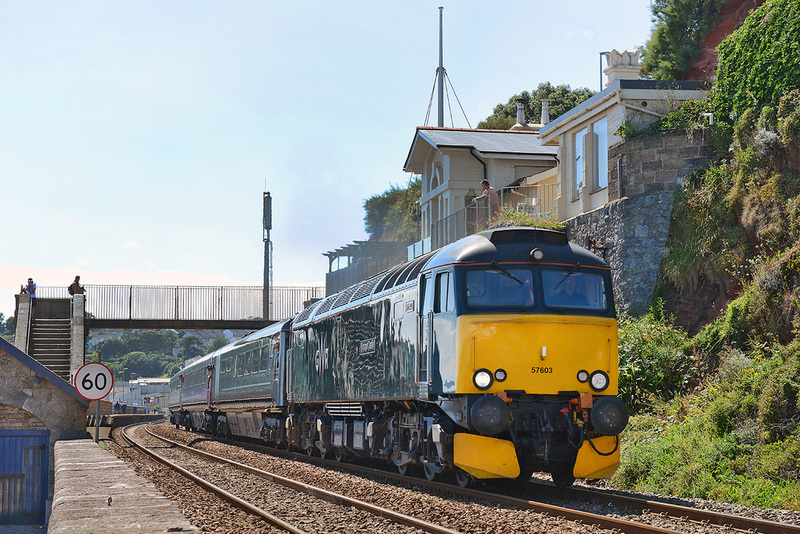 The Saturday Only loco-hauled Great Western 2C51, 17.50 Exeter St Davids to Penzance on 30 July 2016 departs from Dawlish. The train is powered by GWR-liveried Class 57/6 No. 57605 and formed of four 'Night Riviera' day coaches. 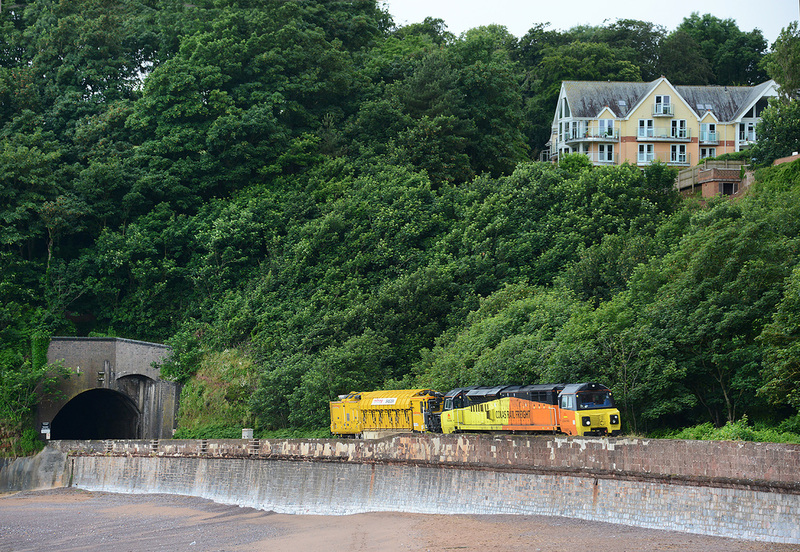 With no sun, at least the light was even when the return 'top and tail' Class 68s went along the Dawlish Sea Wall today, 30 July 2016. Led by No. 68008, the 1Z59 16.30 St Austell to Swansea emerges from Kennaway Tunnel. 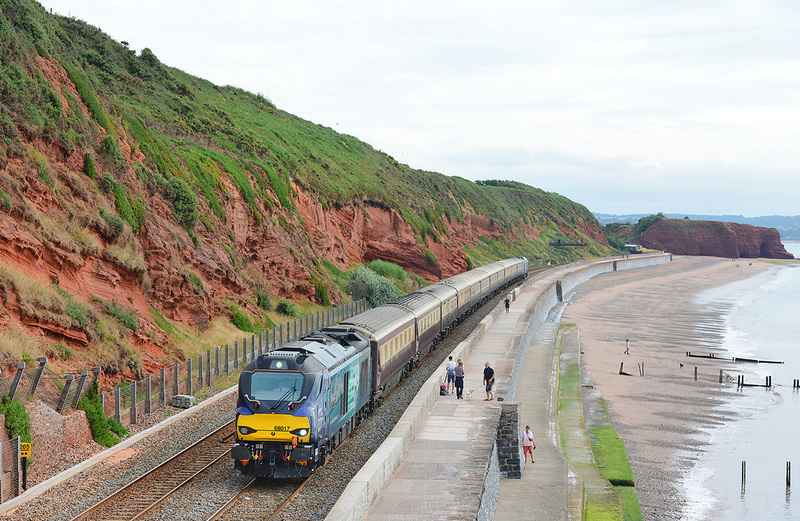 In typical 2016 Devon summer weather, DRS Class 68s Nos. 68017 and 68008 'top and tail' Northern Bell charter 1Z58 the 06.02 Swansea to Par on 30 July 2016. The train is seen traversing the sea wall section between away from Rockstone (Black) Bridge. 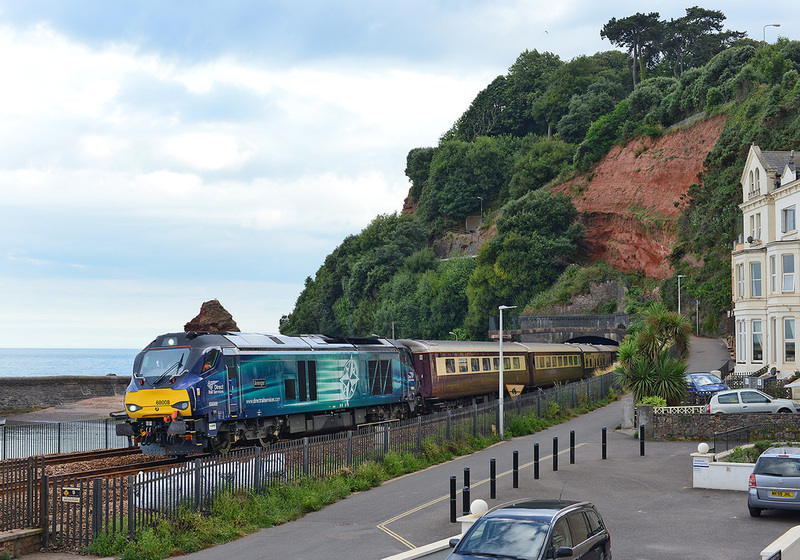 In typical 2016 Devon summer weather, DRS Class 68s Nos. 68017 and 68008 'top and tail' Northern Bell charter 1Z58 the 06.02 Swansea to Par on 30 July 2016. 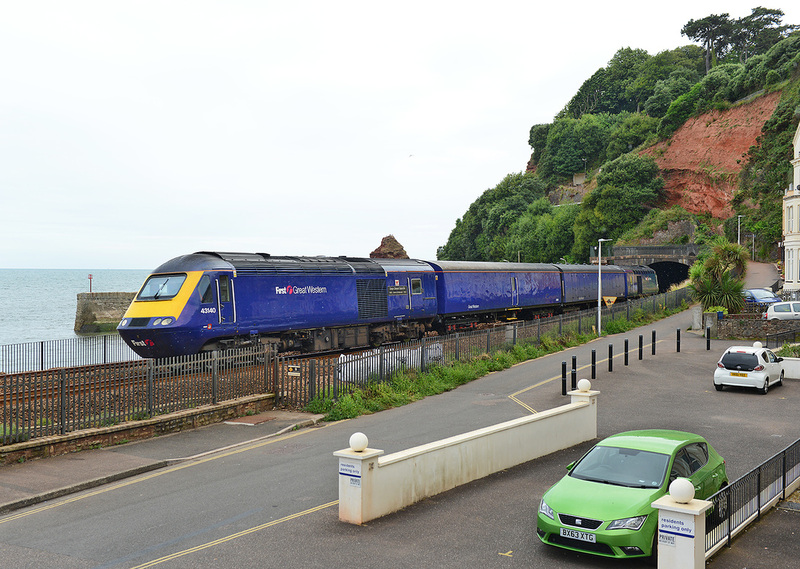 The train is seen traversing the sea wall section between Langstone Cliff and Rockstone (Black) Bridge. 66122 passes Doncaster, 09.36 Wakefield Europort to Felixstowe South, 29 July 2016. 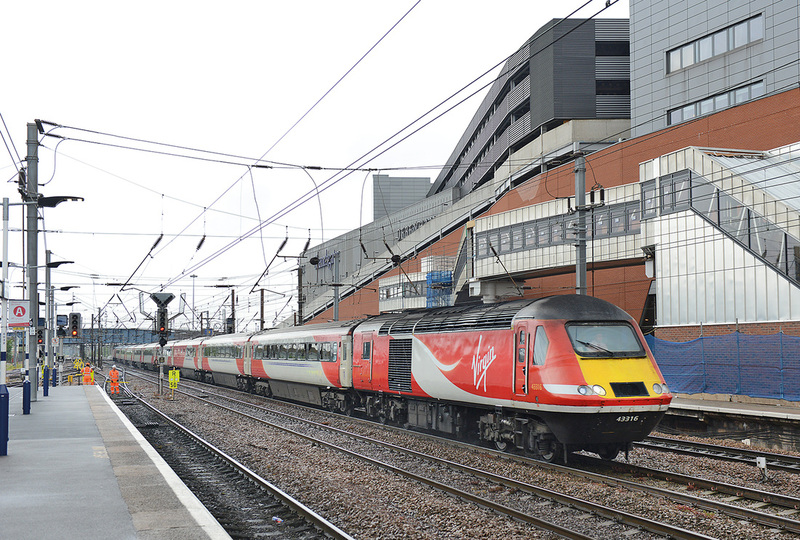 Virgin East Coast No. 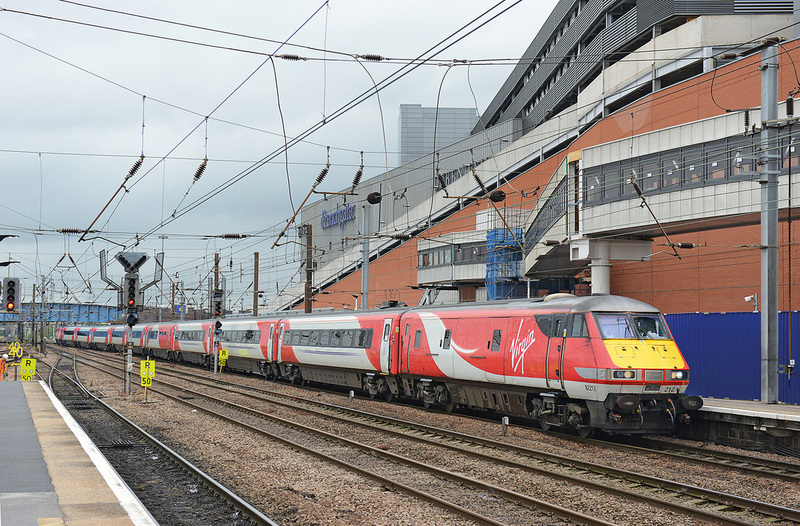 43316 passes Doncaster, 1E05, 07.30 Edinburgh - Kings Cross, 29 July 2016. 82212/-/91105 arrive at Doncaster, 1A19 09.16 Leeds to Kings Cross, 29 July 2016. 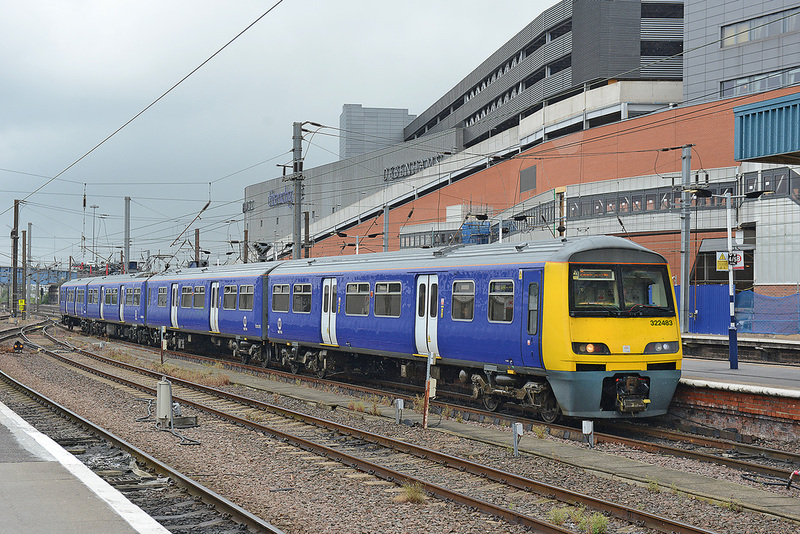 322483 arrive at Doncaster, 2B09 09.21 Leeds to Doncaster, 29 July 2016. 144001 arrive at Doncaster, 2P63 09.19 Scunthorpe - Lincoln, 29 July 2016. 66554 + 66594 pass Doncaster, 08.47 Leeds FLT - Felixstowe North, 29 July 2016. 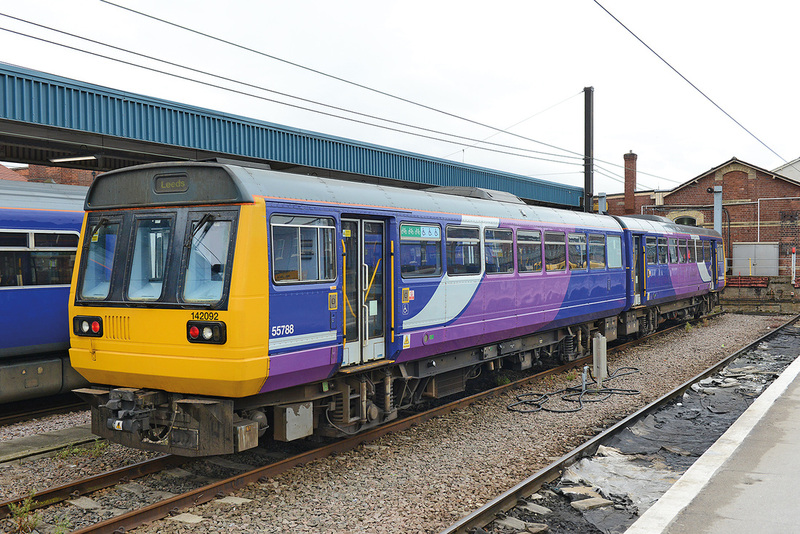 142092 stabled at Doncaster station, 29 July 2016. 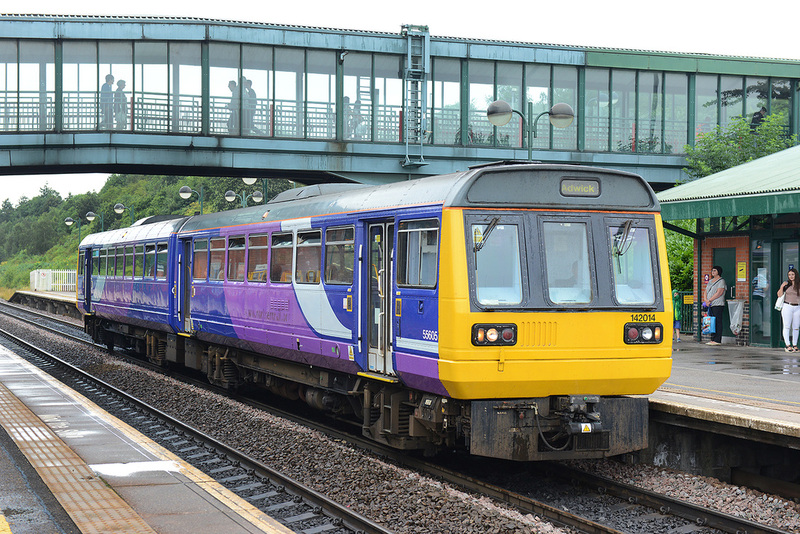 321903 departs from Doncaster, 2B10, 09.26 Doncaster to Leeds, 29 July 2016. 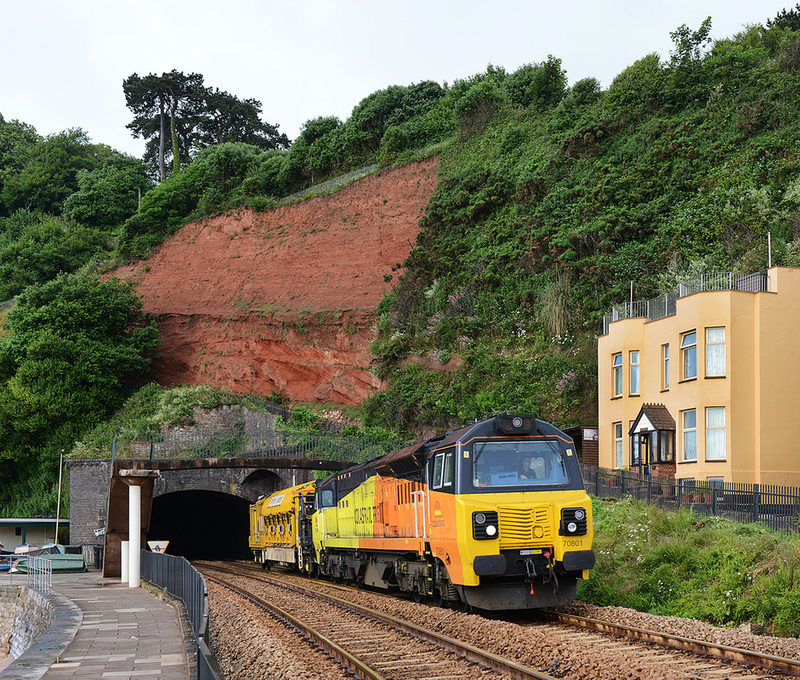 EWS-liveried Class 66 No.66093 emerges from Kennaway Tunnel, Dawlish on 24 July 2016 with the return 'Torbay Express', 1Z28. 16.50 Kingswear - Bristol TM. 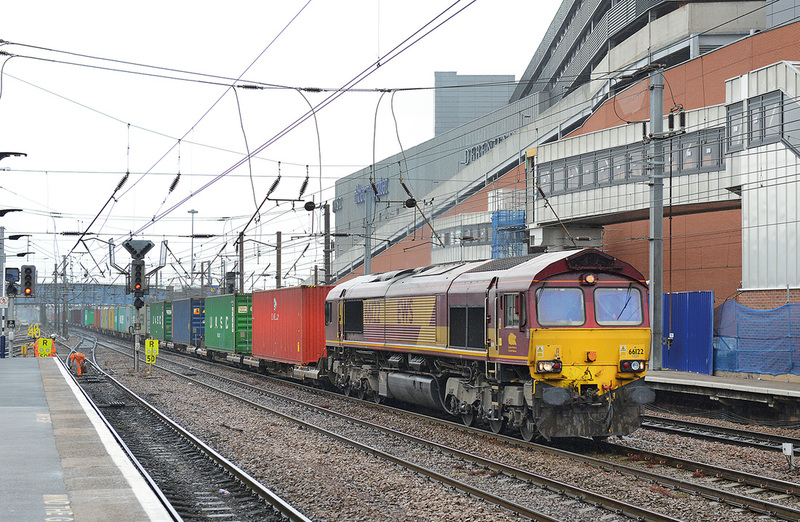 Class 66 used due to booked steam loco 46100 failing. DB-Cargo Class 66 No. 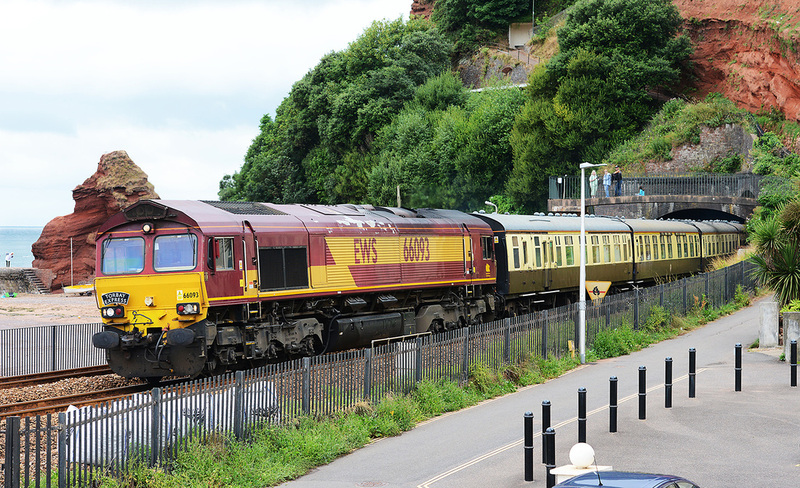 66093 down Dawlsh, 24 July 2016, 1Z27, 08.00 Bristol - Kingswear 'Torbay Express' diesel hauled due to failure of steam loco 46100. 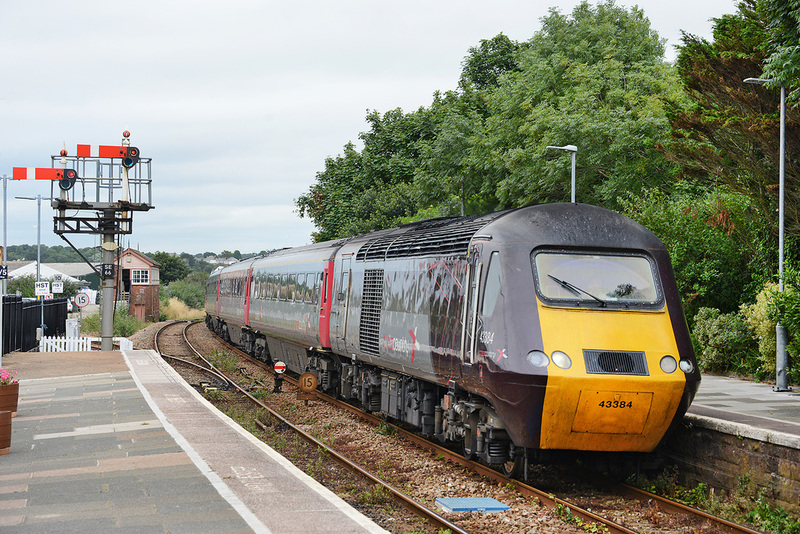 The Saturday Only loco-hauled Great Western 2C51, 17.50 Exeter St Davids to Penzance on 23 July 2016 is seen awaiting departure from its Totnes station stop. The train is powered by GWR-liveried Class 57/6 No. 57603 and formed of four 'Night Riviera' day coaches - 17174, 17175, 12100 and 10219. 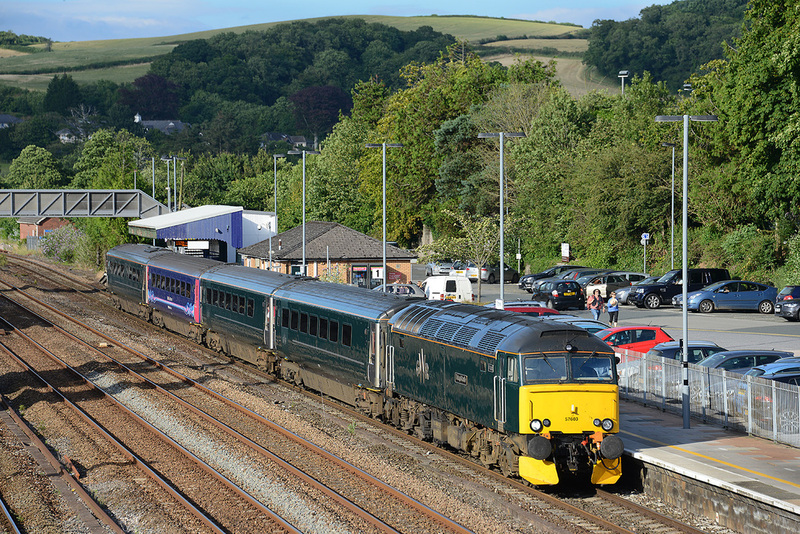 The Saturday Only loco-hauled Great Western 2C51, 17.50 Exeter St Davids to Penzance on 23 July 2016 departs from its Totnes station stop. The train is powered by GWR-liveried Class 57/6 No. 57603 and formed of four 'Night Riviera' day coaches - 17174, 17175, 12100 and 10219. 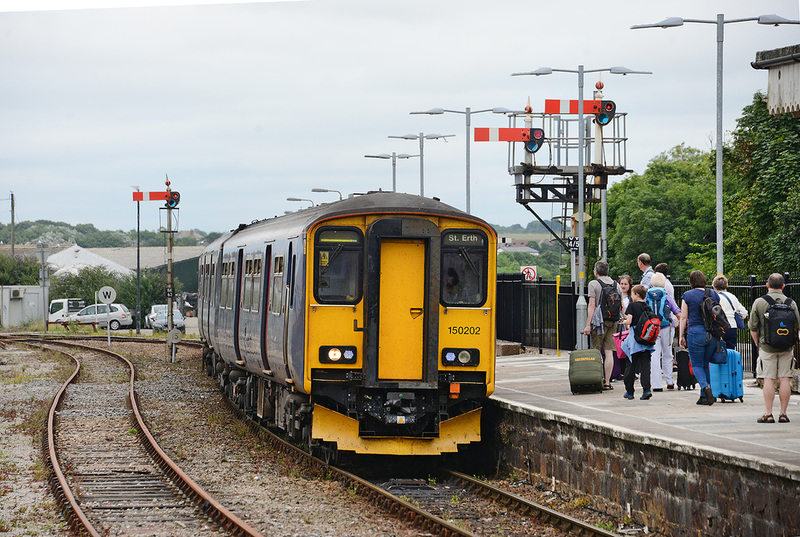 150202 + 150128 arrive at St Erth, 2A18 12.03 St Ives to St Erth, 23 July 2016. 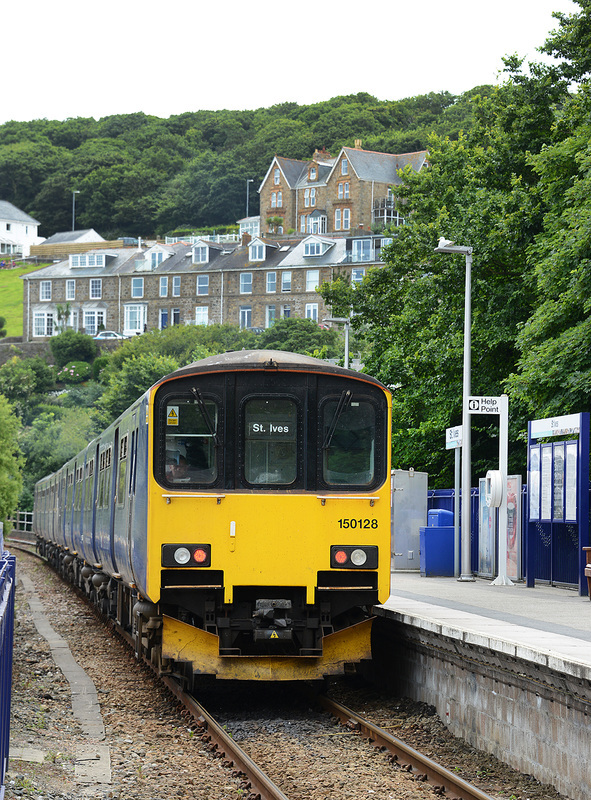 150128 + 150202 depart from St Ives, 2A20 12.33 St Ives to St Erth, 23 July 2016. 150128 + 150202 arrive at St Ives, 2A29 14.49 St Erth - St Ives. 23 July 2016. 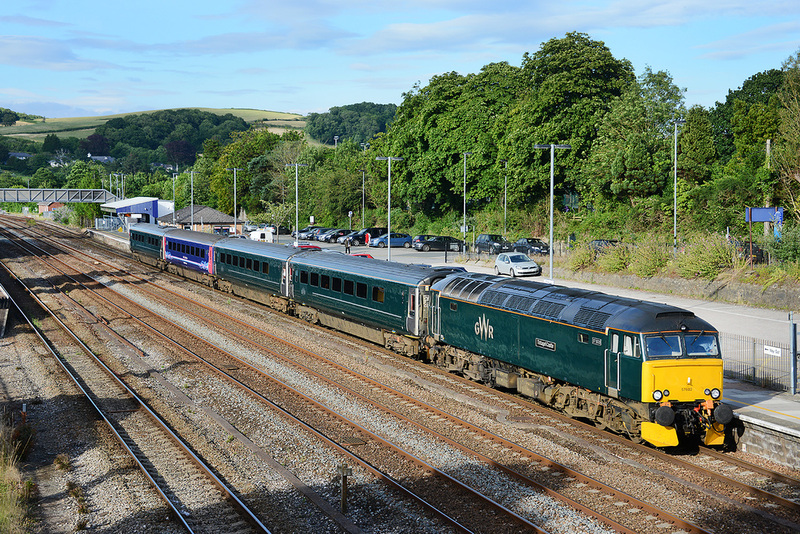 43384/-/43303 arrive at St Erth, 1V48 07.45 York - Penzance, 23 July 2016. 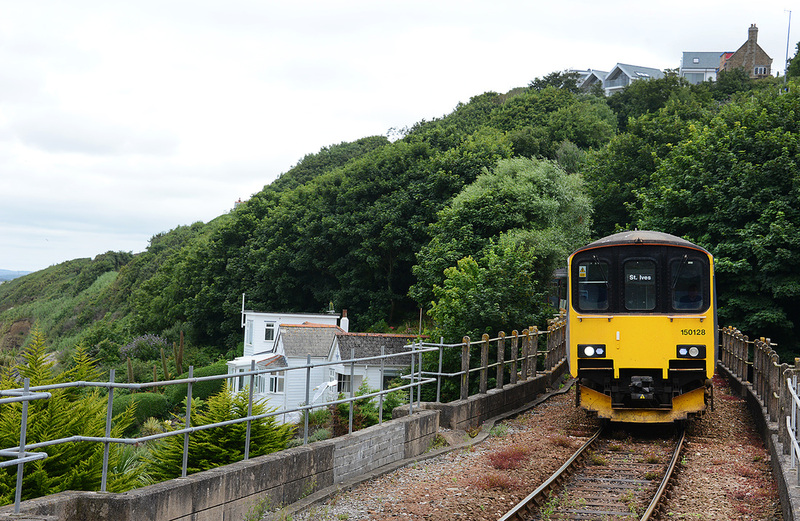 150202 + 150128 arrive at St Erth, 2A32 15.33 St Ives - St Erth, 23 July 2016. 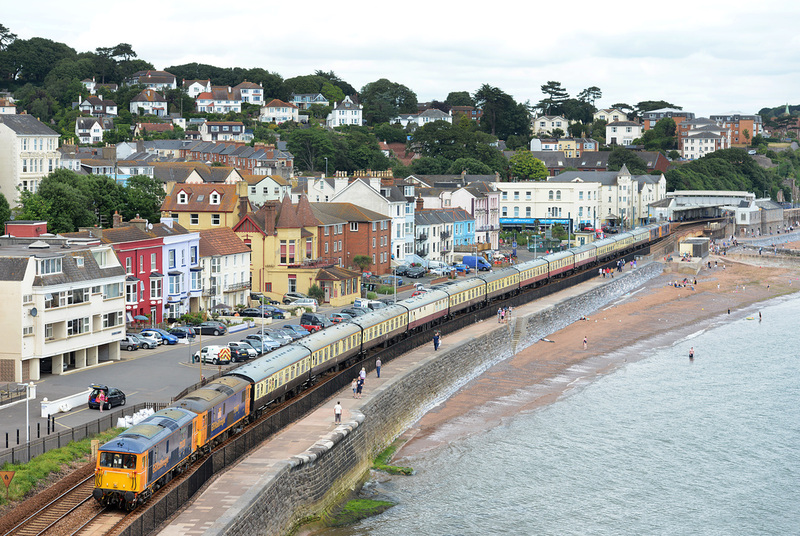 It is a VERY long time since we had a formation like this on the Dawlish Sea Wall. Today, 21 July 2016 GWG operated a 5Z70. 15.45 Laira to Old Oak Common formed of power cars 43140 and 43177 with Mk1 barrier coaches 6336 and 6338 coupled between. The train is seen in not very bright conditions emerging from Kennaway Tunnel. Do these coaches have a requirement at OOC or are they just moving to park up, thus freeing space at Laira? Sunday morning yellow on the Sea Wall. 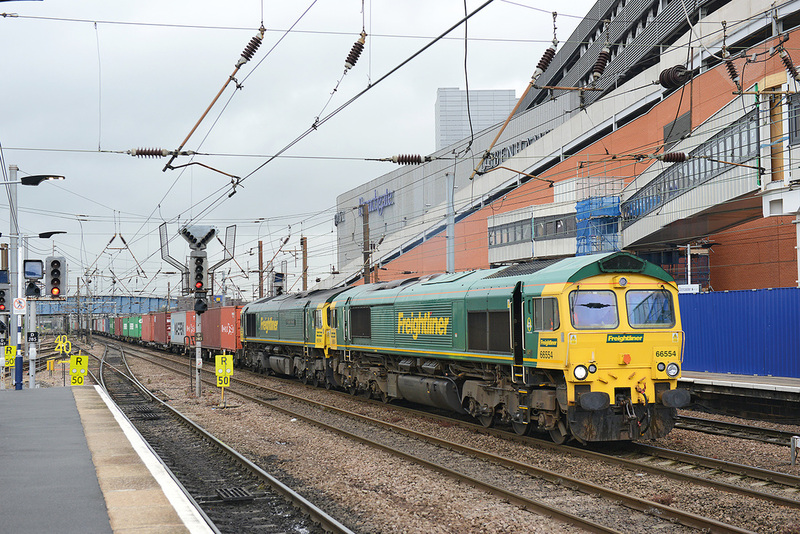 On 17 July 2016, Colas Rail Freight provided their usual entertainment with Class 70 No. 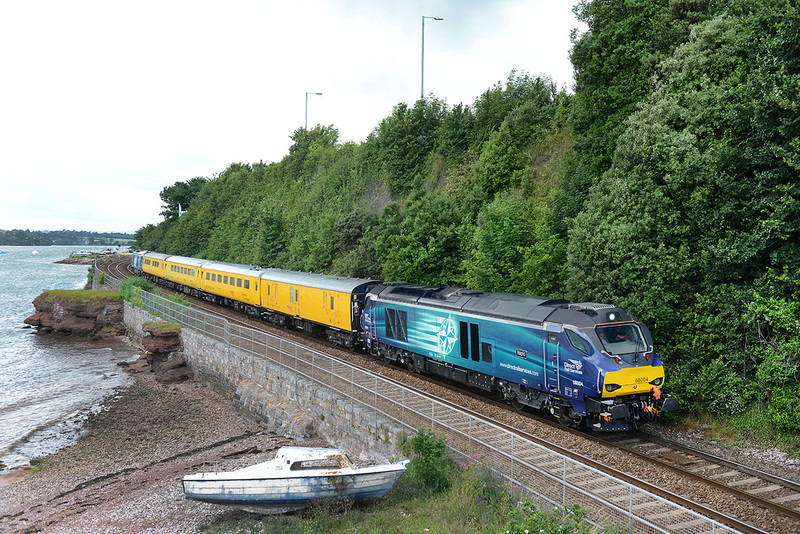 70805 powering the RailVac vehicle, working as train 6X54, the 08.35 Dainton to Exeter Riverside, seen passing below Black Bridge (Rockstone Bridge) between Dawlish and Dawlish Warren. 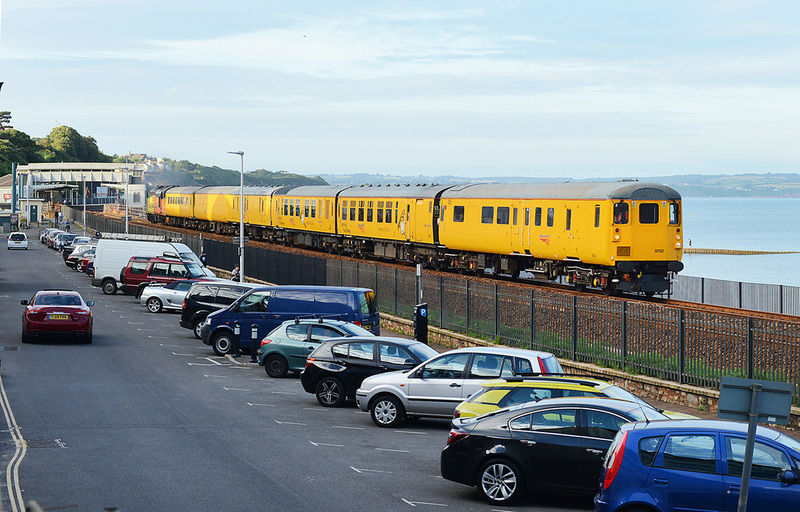 The first Class 73/9 powered train to traverse the Dawlish Sea Wall was today 16 July 2016 when GBRf Nos. 73962 and 73963 led train 1Z74, the 16.24 Paignton to Waterloo charter. Seen passing adjacent to Marine Parade. On the back of the train were Class 73/1s Nos. 73128 and 73107. 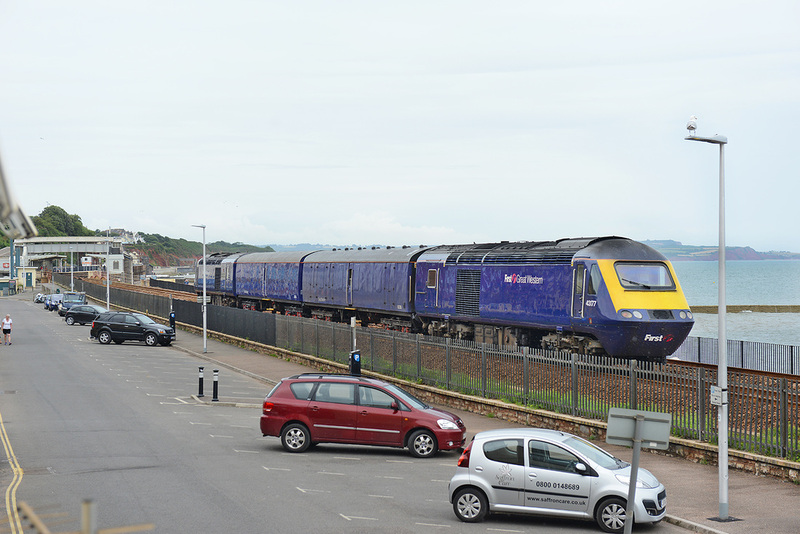 Could not be bothered to go further than Dawlish to capture this as the light was 'crap'. 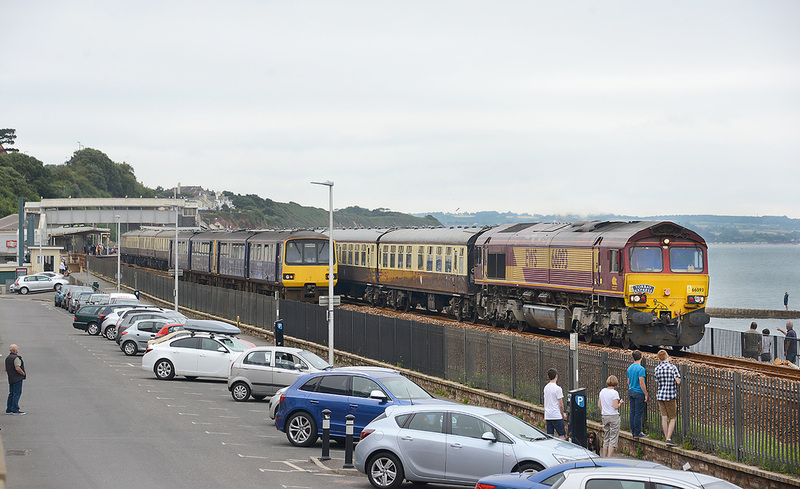 73128 and 73107 struggle west along the Dawlish Sea Wall on 16 July 2016 powering train 1Z73, the 09.19 Basingstoke to Paignton (should have started at Waterloo but stock was running late). On the rear are Class 73/9s Nos. 73962 and 73963. Sunday steam. 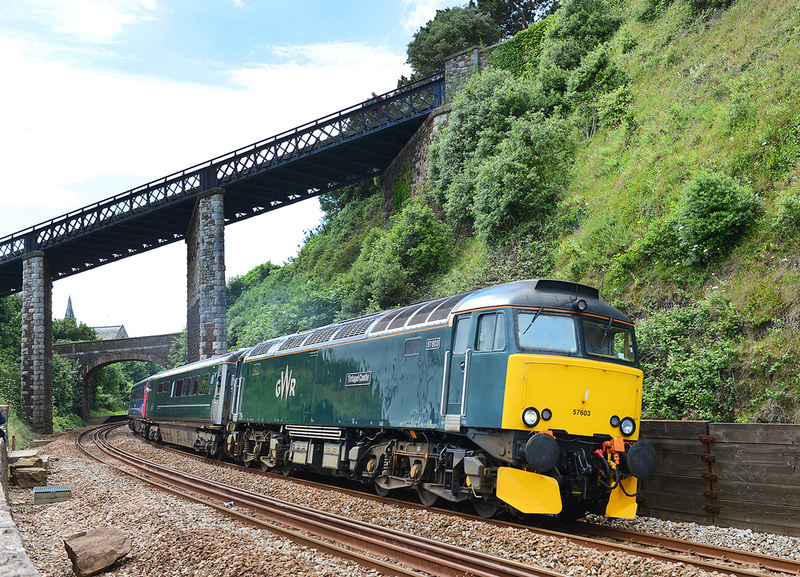 The 'Torbay Express' 1Z27, 08.15 Bristol Temple Meads to Kingswear on 10 July 2016 powered by No. 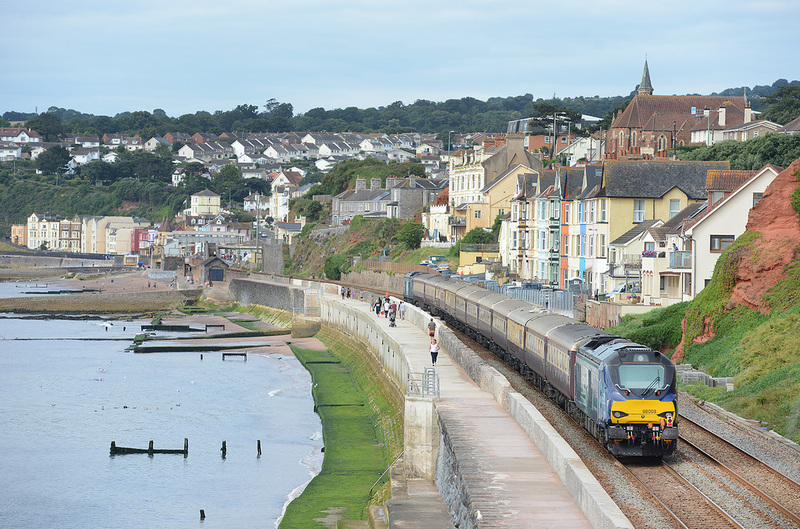 46100 Royal Scot heads west through Dawlish, while FGW-liveried HST set with power car No. 43171 on the rear, forms train 1A81 the 08.30 Penzance to Paddington in the opposite direction. A few in Marine Parade got bowled! Sundays would not be complete without the morning visit of a Colas Rail Freight loco and RailVac4. Today, 10 July 2016, it was the turn of 70099 (70801) to perform the honours leading train 6X54 the 08.35 Newton Abbot West Junction to Exeter Riverside, seen storming out of Kennaway Tunnel. Class 57/6 No. 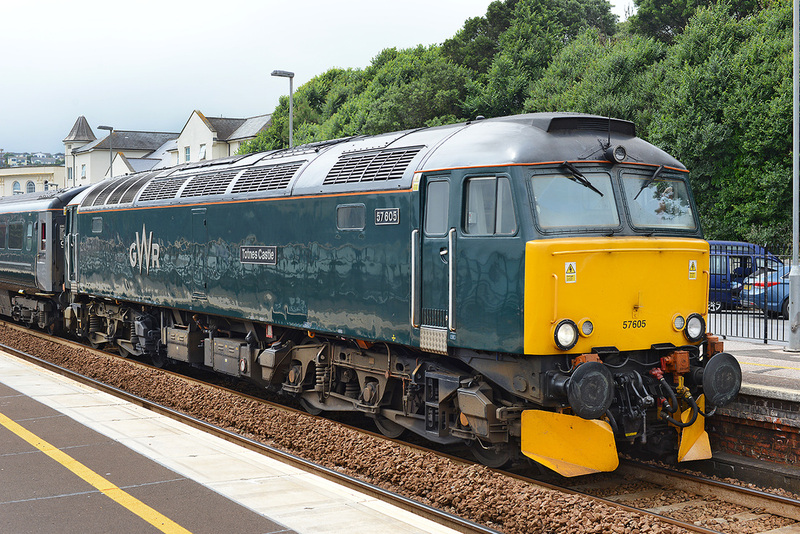 57605 stands at Dawlish on 9 July 2016 with train 2E75, 13.35 Plymouth - Exeter SD (10219, 12100, 17174). 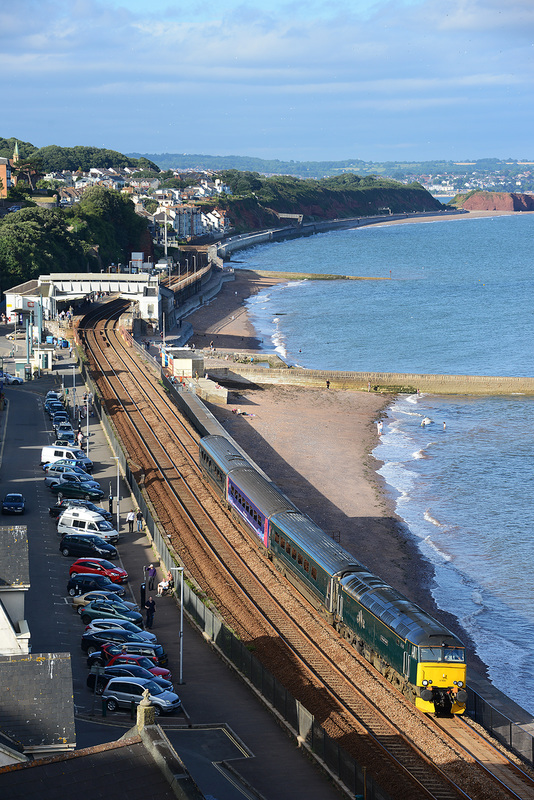 A nice bit of summer evening light today 8 July 2016 allowed the down 3Q91, 19.24 Exeter Riverside to Exeter Riverside via Goodrington to be captured passing good old Dawlish. Led by DBSO No. 9702, the train was powered by Colas Rail Freight Class 37 No. 37219 on the rear. This rear view shows the train entering Kennaway Tunnel. Front view of above train. 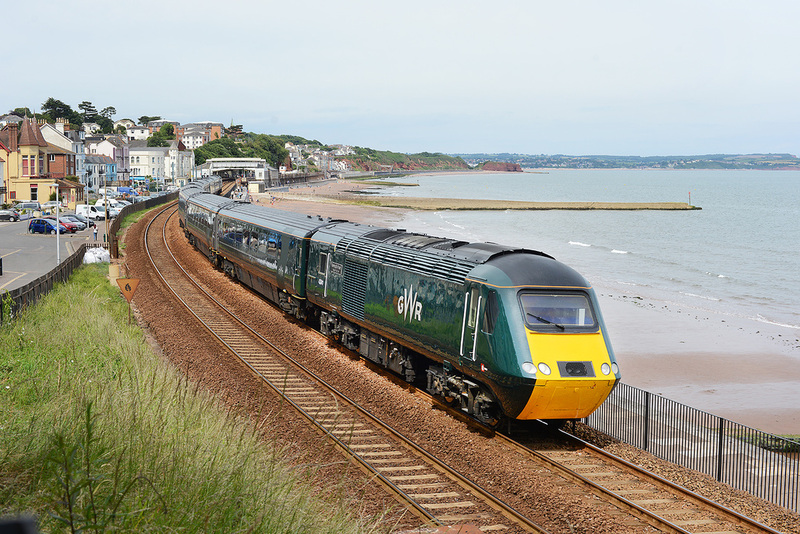 The second of the GWR HST sets to receive green livery, power cars Nos. 43041 and 43005 with passenger set No. 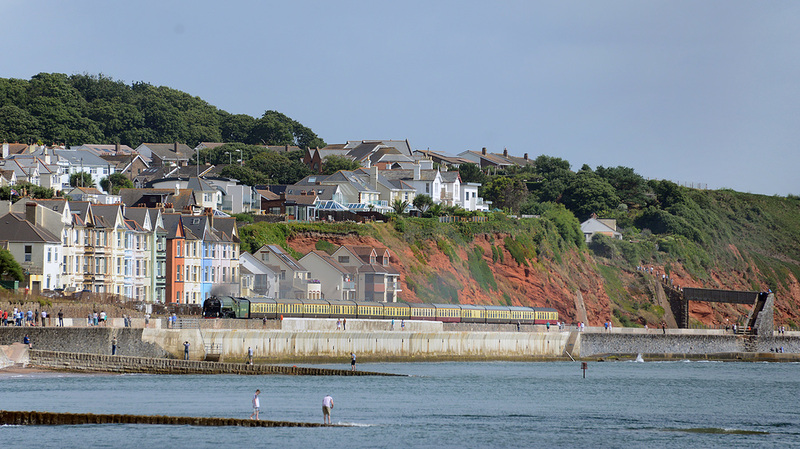 LA16 pass Dawlish on 6 July 2016 forming train 1C83 13.05 Paddington to Penzance. 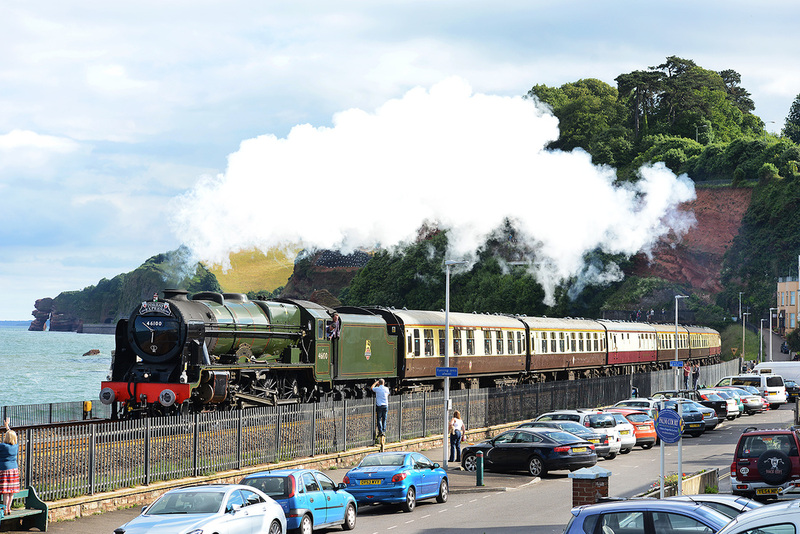 46100 Royal Scot passes Dawlish on 3 July 2016 with the first return 'Torbay Express' of 2016, 1Z28 16.50 Kingswear to Bristol TM. 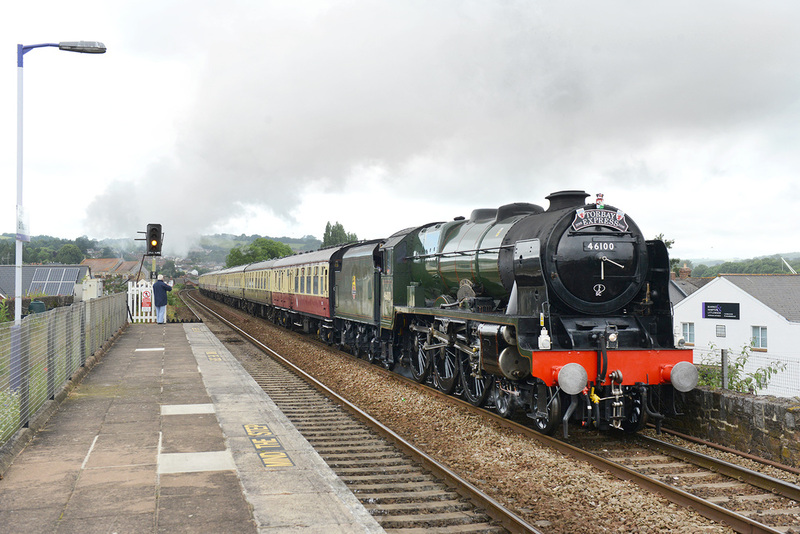 46100 Royal Scot passes Exeter St Thomas on 3 July 2016 with the first 'Torbay Express' of 2016, 1Z27 08.00 Bristol TM to Kingswear. 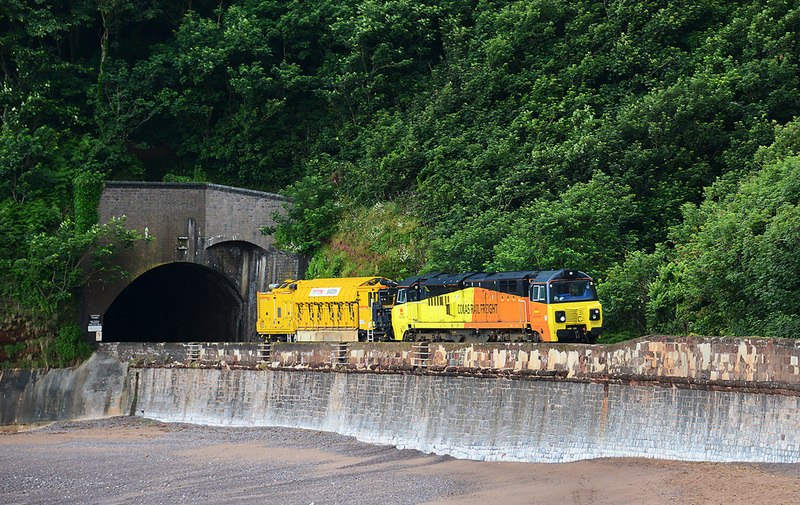 70807 emerges from Coryton Tunnel, Dawlish powering 6X54, 09.00 Plymouth to Westbury, formed of RailVac4. 3 July 2016. It would be rude not to go out for the GWR Day Riviera service. On Saturday 2 July 2016, Class 57/6 No. 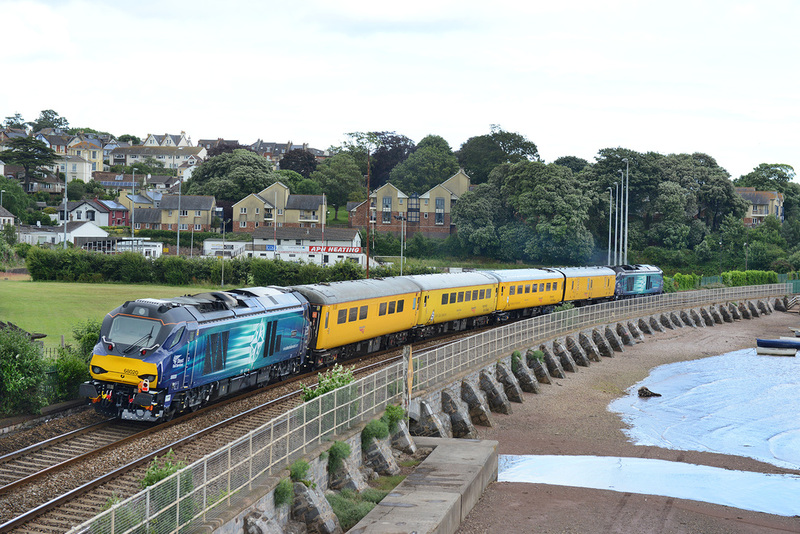 57603 pulls away from the Teignmouth stop and rounds onto the Sea Wall with train 2E75, the 13.35 Plymouth to Exeter St Davids, today formed of just three Mk3 passenger vehicles. On Saturday 2 July 2016, Class 57/6 No. 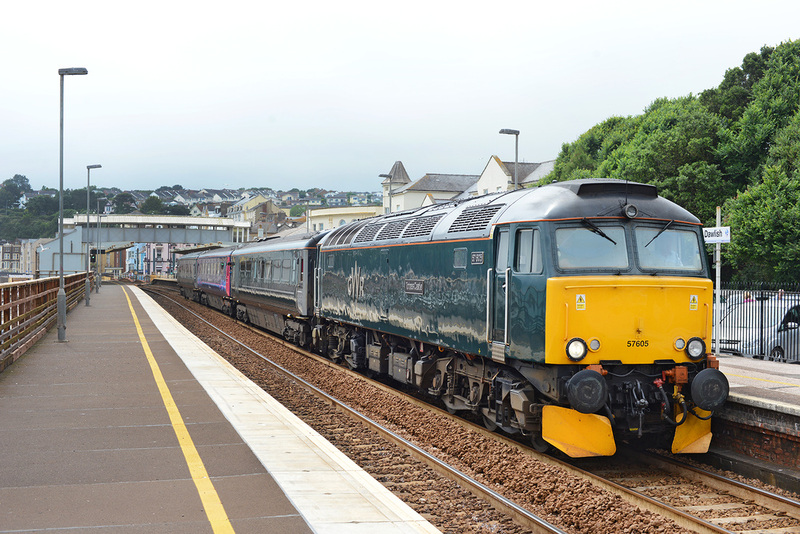 57603 pulls into the Dawlish stop with train 2C51, the 17.50 Exeter St Davids to Penzance, formed of just three Mk3 passenger vehicles. On 1 July 2016 'top and tail' DRS Class 68s Nos. 68004 and 68020 with Network Rail test train 1Z18, the 15.46 Paignton to Taunton via Bristol, crosses Cockwood Harbour. The train formed is formed of vehicles 6264, 977983, 5981 and 977868. On 1 July 2016 'top and tail' DRS Class 68s Nos. 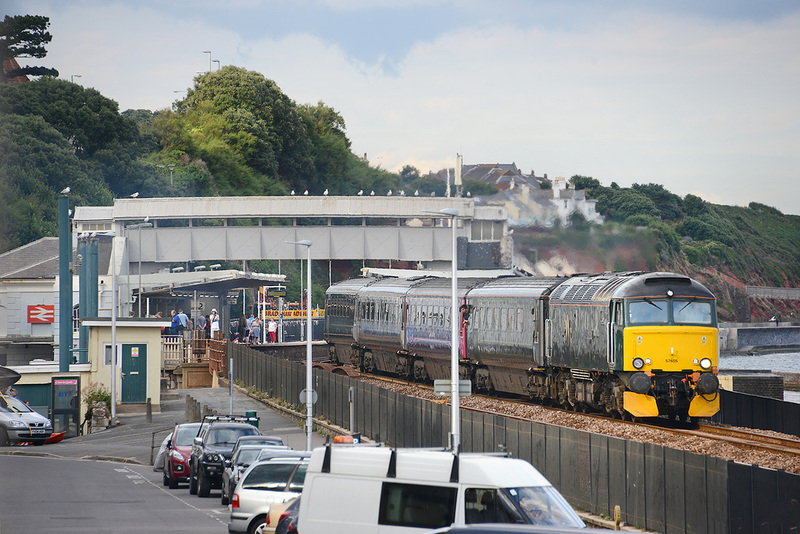 68020 and 68004 with Network Rail test train 1Q18, the 05.35 Old Oak Common to Paignton via Paddington, Penzance and Teignmouth approaches Shaldon Bridge, Teignmouth. With 68020 leading, the train formed of vehicles 977868, 5981, 977983 and 6264 with No. 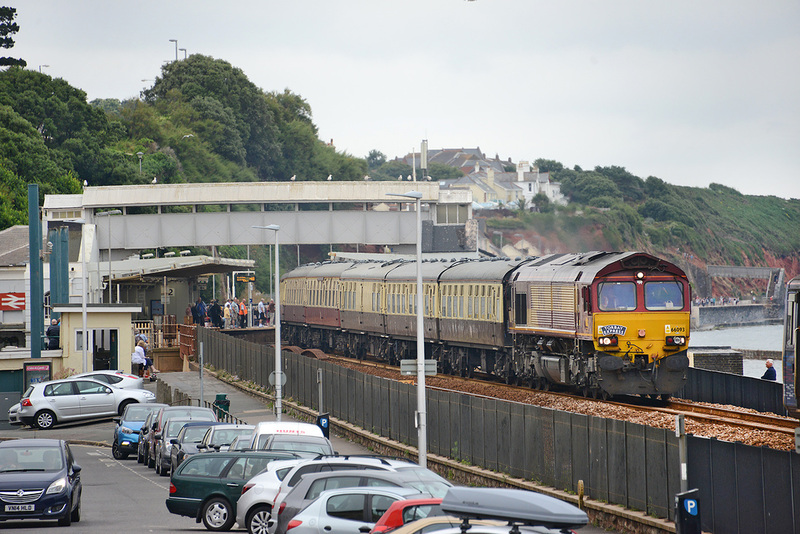 68004 on the rear departs for Paignton after changing direction at Teignmouth. On 1 July 2016 'top and tail' DRS Class 68s Nos. 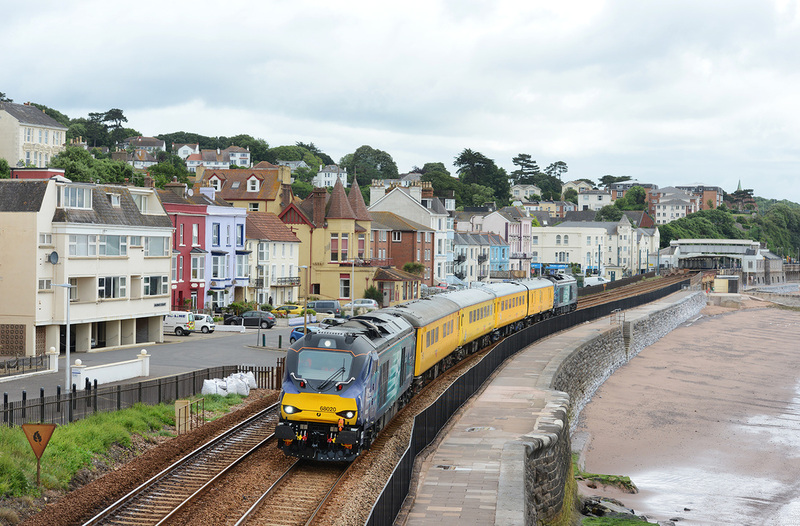 68004 and 68020 with Network Rail test train 1Q18, the 05.35 Old Oak Common to Paignton via Paddington, Penzance and Teignmouth approaches Shaldon Bridge, Teignmouth. 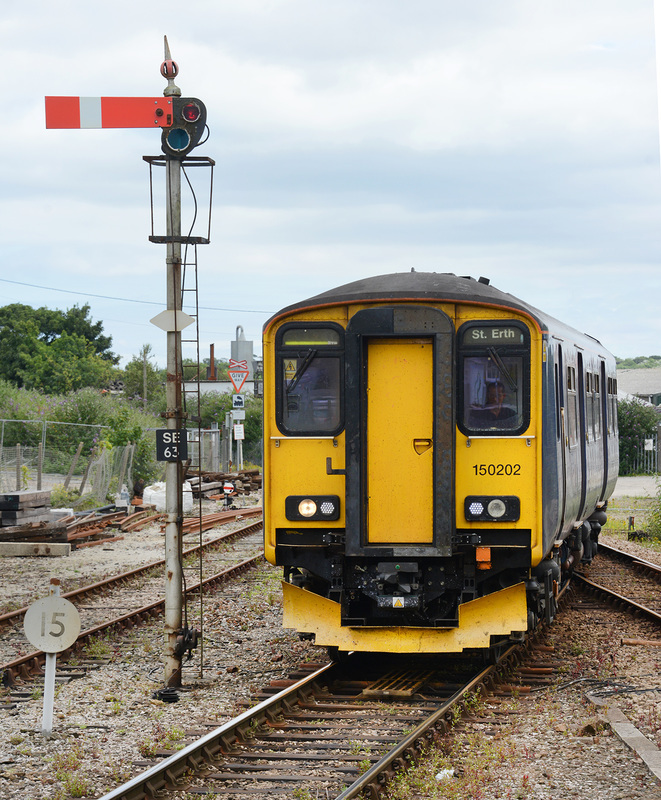 The train formed is formed of vehicles 6264, 977983, 5981 and 977868. 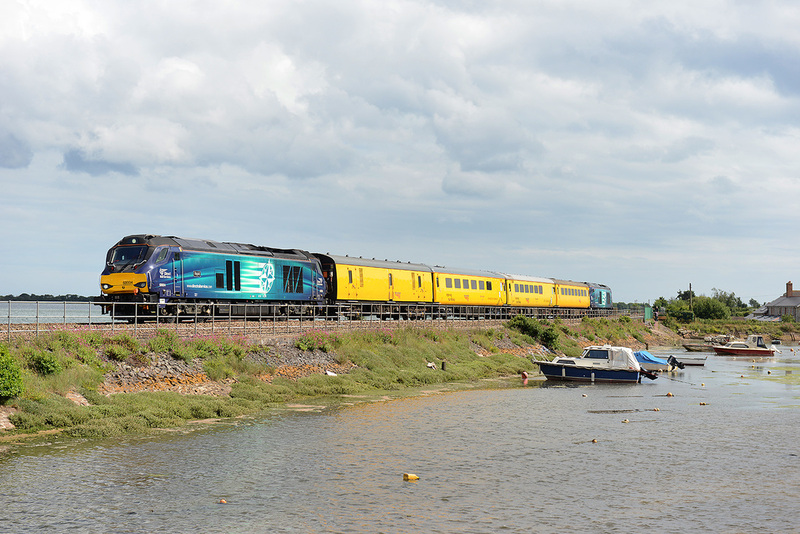 On 1 July 2016 the Sea Wall saw 'top and tail' DRS Class 68s Nos. 68020 and 68004 in charge of Network Rail test train 1Q18, the 05.35 Old Oak Common to Paignton via Paddington, Penzance and Teignmouth. With 68020 leading, the train formed of vehicles 977868, 5981, 977983 and 6264 with No. 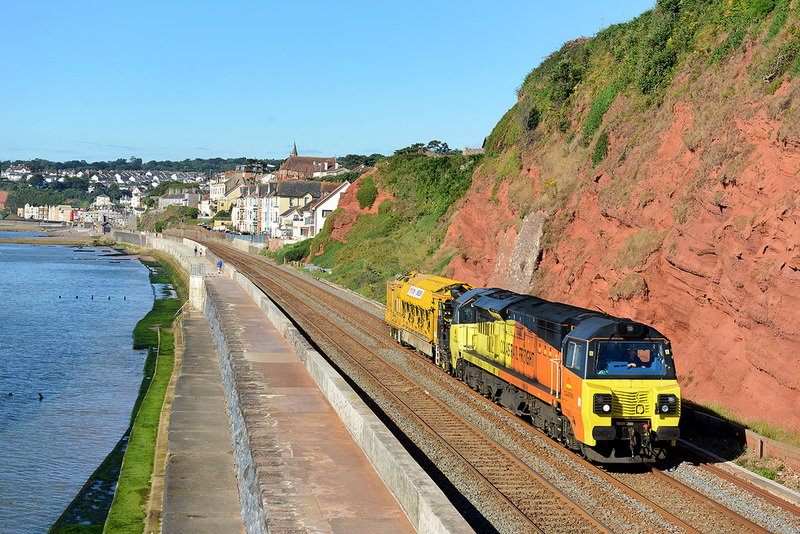 68004 on the rear heads towards Kennaway Tunnel, Dawlish. 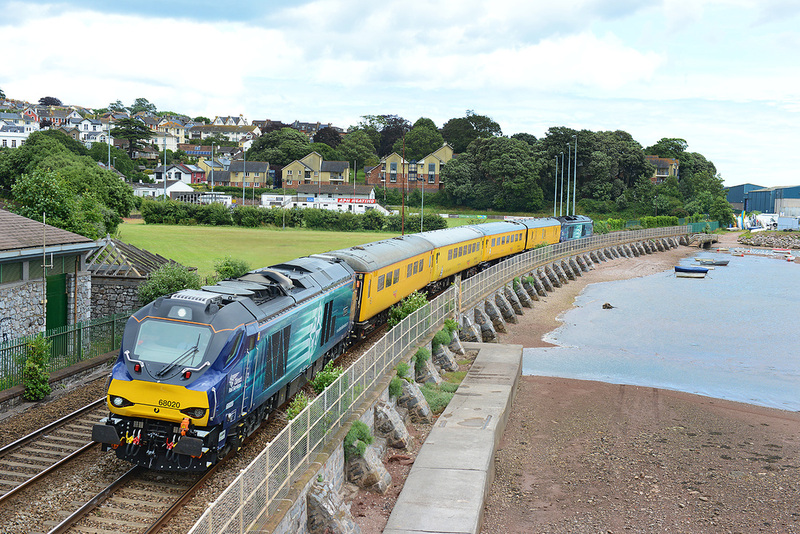 GWR-liveried HST set LA 15 with power cars 43187 and 43188 pass Shaldon Bridge, Teignmouth on 1 July 2016 with the 12.06 Paddington to Penzance service.